Vanilla-friendly mods for a better RimWorld! master_wu (Simplified Chinese for ExpandedCloth, ExpandedCrops, and MoreBedsCloth). Existing users of 2.0.0 can download this patch and extract it into your Mods folder, overwriting any old files. 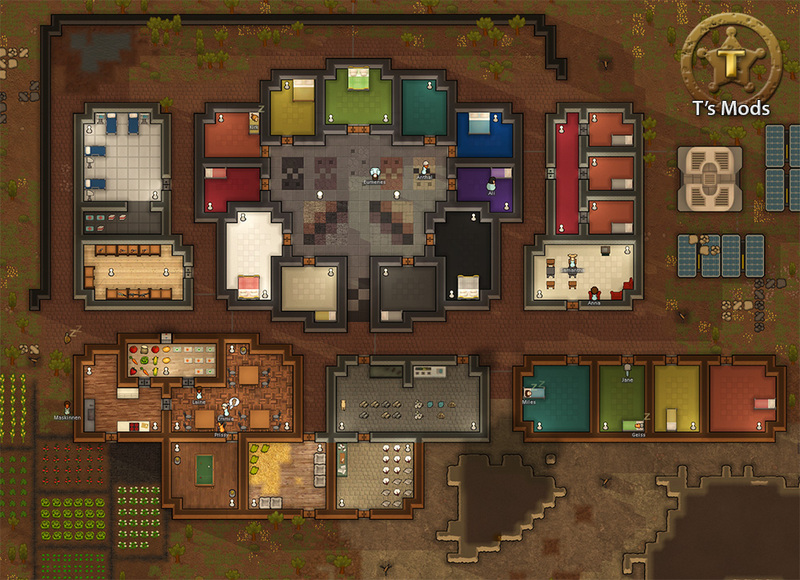 Nothing at all, just a bump in version number now that the mod is out for RimWorld 1.0. Hopefully I didn't miss any significant balancing changes between B19 and 1.0, but if I did, let me know and I'll get around to it. [T] ExpandedCloth :: Tweaks the game's cotton and cloth system. ● Cotton plants yield raw cotton fibre. No more magical cloth directly from plants! [T] ExpandedCrops :: Expands and refines the fruit and vegetables your colonists can grow. [T] MiscStuff :: Things that don't fit anywhere else. [T] MoreBeds :: Bored of plain beds? Indulge your inner decorator with new bed graphics and colours. ● MoreBedsCloth changes all beds to require some cloth to build, while MoreBedsVanilla doesn't - use one, not both! [T] MoreFloors :: You can never have too many styles of flooring! [T] RawCropThoughts :: Adjusts vanilla crops with added detail. ● More compatibility to come! ● Vegetable Garden by dismar - takes the idea of expanding the crops your colony can grow and runs with it into the far distance! 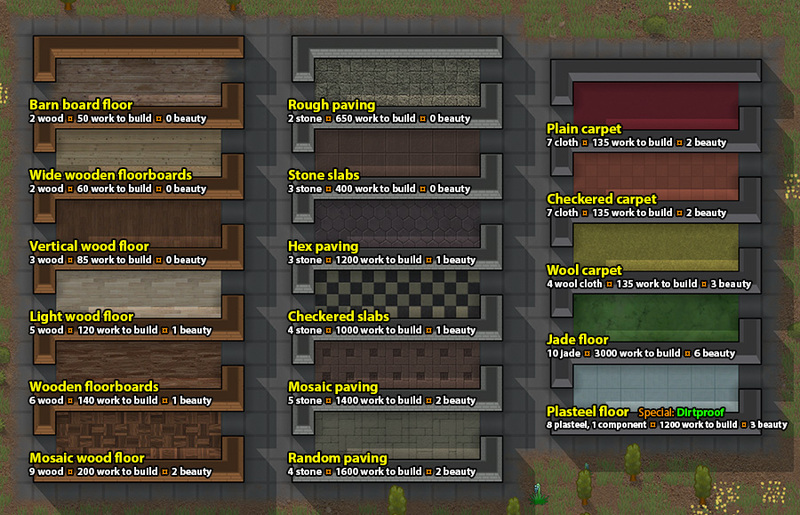 ● Architect Sense / Stuffed Floors by Fluffy - an excellent mod for keeping your architect menu tidy. It completely integrates all of the added flooring styles in MoreFloors with only one minor drawback of not having per-floor work-to-build, beauty, and materials required. ● More Furniture by Anonemous2 - if you like giving your colonies a bit of character with extra decorations and... well... more furniture, this mod is definitely for you. 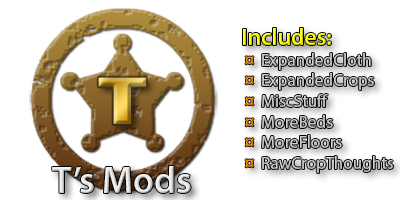 IMPORTANT: Unless you're using a TMods patch designed for older versions, make sure you delete any old versions of TMods before extracting the new ones! Filenames may change between versions and other differences may be present. Overwriting an old installation will almost always cause errors. To install TMods, simply unzip the mod's zip file into your RimWorld "Mods" subfolder, load RimWorld, then activate the parts you want to use by clicking the Mods button on the main menu and ticking the mods to enable. You're welcome to do pretty much whatever you like with all of my mods, but you may not directly sell or lock behind a paywall anything that includes them (taking donations is fine, though). If you use some or all of T's Mods in your own mod or modpack, please credit me and include a link back to this forum post or the mod's RimWorld Nexus page. Thanks! Some artwork in T's Mods may be based on existing sources - see credits.txt within each mod's About folder for links to sources. All such art is at least "free for non-commercial use" to the best of my knowledge. These folks have generously spent the time to create translations for T's Mods, either here or on the Steam Workshop. Thanks! See the "T-readme.txt" included in the download for a history of changes. Great work but the download seems broken on Nexusmods site. Looks very good, but as billerinstinct said, downloads are broken. Thank you for the quick mirrors! Whups, sorry about the broken Nexus downloads - not sure what's happening there. I've tried re-uploading them but I'm also getting "An error has occurred". Maybe it takes a few hours for the files to filter through Nexus's system? Meanwhile though I added some Mediafire mirrors which seems to be working better, so grab them through those, and thanks for checking it out! This could be the reason Telkir. Thank you for the mirrors! Edit: Tested the mod a bit. Very nice Textures! And the requirement for cotton cloths is a great addition. Keep up the good work. Linus Torvalds: "But it clearly is the only right way. The fact that everybody else does it some other way only means that they are wrong"
Robert J. Hanlon: "Never attribute to malice that which is adequately explained by stupidity." Awesome mod, the floors are great and new resources, only thing that turns me off is cotton to build beds?. Keep up the great work T.
Tested and updated for Alpha 5. I also find the cotton requirement for beds to be daunting. Yeah, it's a good point. I'll rip out the cotton cloth requirement for beds and put it in a separate mod tomorrow if I get chance. I didn't split cotton for beds into its own sub-mod because it seemed like such a small thing and I wanted to aviod ending up with a dozen or so really miniscule changes that each have their own mod. On reflection this is a good change, though, because it'll tie into something else I wanted to add - varied bed colours! Once done folks can make a choice for their beds, similar to how you can choose CottonCarpets or MoreCarpets. You made new thoughts? That's pretty awesome considering that Alpha 4F didn't allow modders to do that. Also, I was expecting the cloth to be made into clothes, since there's now armor for pawns. I'll definitely try out this mod. Can you do a dropbox or MediaFire version of this? Nexus is always sketchy for my computer. Os iusti meditabitur sapientian, et lingua eius loquetur iudicium. Venerit vir qui sufferit tentationem.